In the age of 60-hour work weeks, entrepreneurial side hustles, and investing time in hobbies while prioritizing family and friends, stress can take its toll. And, let’s face it, no matter how productive we believe we are by cutting back on sleep and putting in extra work every night and weekend, we are genuinely overwhelming ourselves, becoming cranky, and actually, being less productive. That is why taking a break here and there to focus on self-care is so important. Thankfully, Durham is a haven full of places to take a step back and de-stress. Here are five ways to de-stress in downtown Durham. 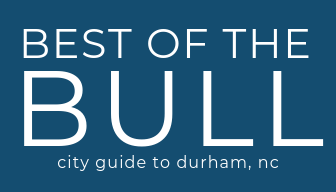 Downtown Durham is sprinkled with quaint boutiques and local shops that breathe authenticity. Whether you are looking to buy or simply window-shop, the positive energy of the shops and friendly staff members will cause you to lose track of time as you stroll. One shop whose radiant vibes and merchandise always shifts me into a positive mood is Everyday Magic. From crystals to sage to luxurious candles, this shop will help you take the deep breath you need. Books on self-care and channeling your inner power are on display, and you can select a tea that will comfort you, or energize you, depending on your mood. The shop also puts on a variety of events including Henna by Nadia and an adoption event with Hope Animal Rescue. A piece of magic can truly be found here. Additional shops in the area with jaw-dropping pieces include Vert & Vogue, Magpie Boutique, and Fifi’s Fine Retail Apparel. The picturesque journey to these locations alone will move you into a place of serenity. When your back is in knots from tensing up at your desk or your nails are slightly fringed from nervously nibbling, it is time to treat yourself. The Retreat at Brightleaf is conveniently located in the Brightleaf District of downtown Durham, and their massage services will send ripples through your spine. The Retreat offers many types of massages, facials, waxing, and peels for a reasonable price, and their experienced staff will help the tension that has been building for months to dissipate. Another perk about The Retreat? Rose’s Noodles, Dumplings, & Sweets is right around the corner. How does a Chocolate Sea Salt Tart sound after a 60-minute Swedish/Relaxation massage? Taking a walk to sightsee around the city instills a sense of wonder in tourists and Duramites alike due to the city’s endless amount of brick and rich history. The height of the smoke-stacks, chapels, and the Lucky Strike water tower always have you looking up in awe. Touring the city as a way to disconnect is valuable because it can be done your way in your own time. You can roam at your leisure or pick up the pace to get your heart rate up and still catch all the views Durham has to offer. Two locations to explore include American Tobacco Campus and Duke University. As you venture through American Tobacco Campus make sure to pass by the Full Frame Theater, Lucky Strike tower, Durham Bulls Stadium, and the tile mural created by students from Durham School of the Arts. The tile wall is a great spot for a photo op. Duke University’s main campus is a short drive from the center of downtown, and the trails around and through campus will leave you rejuvenated. As you tour the campus, stop inside the Perkins Library to peek at the interior design. Simply the smell of coffee or tea can be a mood booster and transcend us to a place of comfort or familiarity. The local coffee scene in Durham has a knack for making people feel at home. Kaffeinate, a resident of N. Duke Street, has succeeded in doing just that. With black and white tile flooring that doubles as an Instagram backdrop and a team dedicated to providing the best service (and latte art), you will want to spend hours of your Sunday afternoon seated at the window. One of my favorite aspects about coffee shops is you can bring a collection of activities with you including a novel, notebook, sketchbook, puzzle, coloring book, etc. There is no better place to practice your moonscapes than next a Matcha Latte. Craft beer and lengthy wine menus can be found by turning a corner in the heart of Bull City. If you are lucky, or do your research, you will stumble upon an establishment with live music and patio seating. West End Wine Bar in West Village features jazz every Sunday from 4-6PM and offers a wine list that will tempt you to taste more than one. A crisp glass of Chardonnay in 70-degree weather while listening to the jazz guitar will help the workweek anxiety melt away. Pour Taproom has also discovered a way revitalize the overworked by mixing self-serve taps and board games. Grab a wristband and have a blast sampling a variety of ciders, beers, and wines lined along the wall. The city’s local selections from Bull City Cider Works “Orange You A Hippie” to Fullsteam’s “Cosmonaut” will not disappoint. Don’t forget to bring a few friends to battle it out with while playing Trouble, Connect 4, or Battleship. Article and photos by our incredible contributor, Ashley Grimes. Interested in writing for us? Visit this page. After graduating from the College of Charleston in 2016 with a Bachelor of Arts in English, I moved to Bull City to accept a position as a Director of First Impressions at an architecture firm. A year and a half later, I am amazed by the growth of the city and the number of places I still need to explore. My spare time consists of enjoying the local restaurant scene, taking and editing photographs, roaming around Target, and cuddling my two kittens!